A key characteristic of a Jean Paul Gaultier design is a love of the unexpected. Street fashion, particularly punk, went hand-in-hand with couture in the form of a full length evening gown intricately made with camouflage or a denim dress finely fringed and dazzling with jet beading. Gaultier also used the unexpected to challenge traditional concepts of gender and beauty as excellently demonstrated in his corsets. One corset for men had typically girly attributes -powder pink with matching velvet bows tied at the shoulders - but with the boning gathered together just above the navel to create an elegant fan shape that also flattered the male figure. Other corsets included the exaggerated conical variety as famously worn by Madonna (one of many strong and uncompromising women who inspired Gaultier) on her Blonde Ambition tour and a maternity design with a curved protruding tummy. 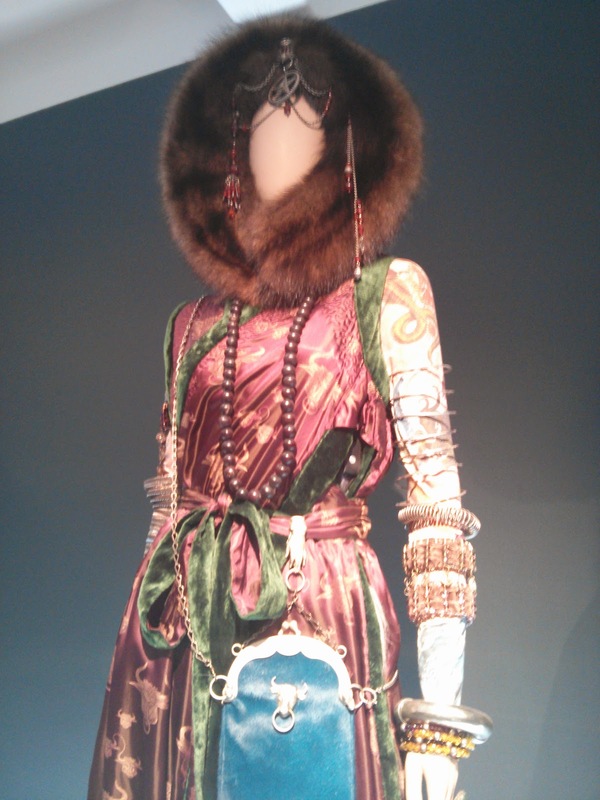 Influences in Gaultier’s creations are rich and vast. Opulent catholic iconography came straight from his childhood. Other notable inspirations come from sailors, fetish clothing, light-hearted French stereotypes (including a stunning tribute to the can-can - a wired circle skirt raised at the front to reveal a wheel of stockinged legs on the inside of the fabric) and cultures from around the world. Unlike many other couture designers, Gaultier is refreshingly non-elitist. TV personalities stood alongside international pop stars and supermodels draped in his exquisite masterpieces on the gallery walls. 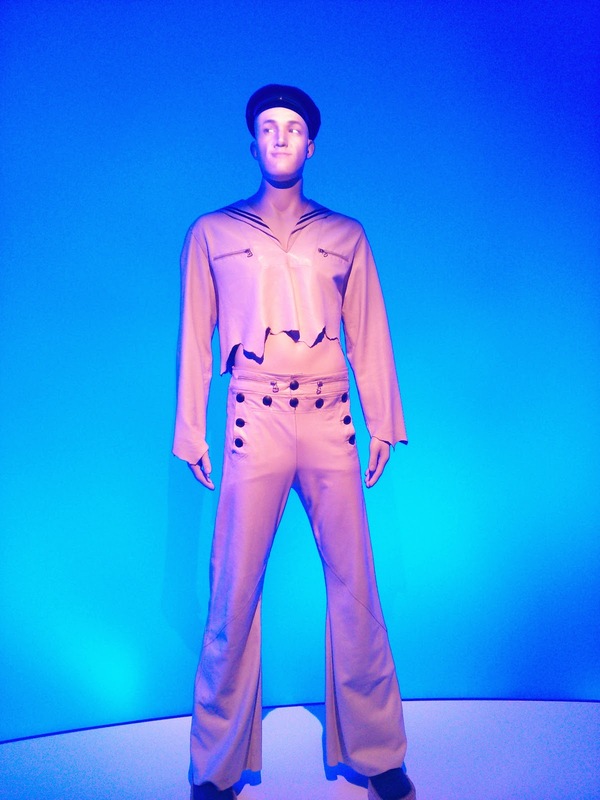 One room in the exhibition was completely dedicated to Gaultier’s appearances on the small screen with his Spitting Image puppet proudly on display and a screen projecting clips from the British 90s Channel 4 favourite Eurotrash which he co-presented. Gaultier’s rap video How To Do That (1989) also features which is full of humour while also showcasing the latest collections as modelled by an army of uniquely beautiful men and women. Watching Gaultier’s TV work, more than ever it felt that public figures are now too careful with what they associate themselves with and a sense of fun has been lost no thanks to it. Could you imagine another major fashion name presenting a Channel 4 smutfest? Gaultier broke down snobbish us-and-them barriers, fearless in taking risks, and clearly having a jolly good time in the process. 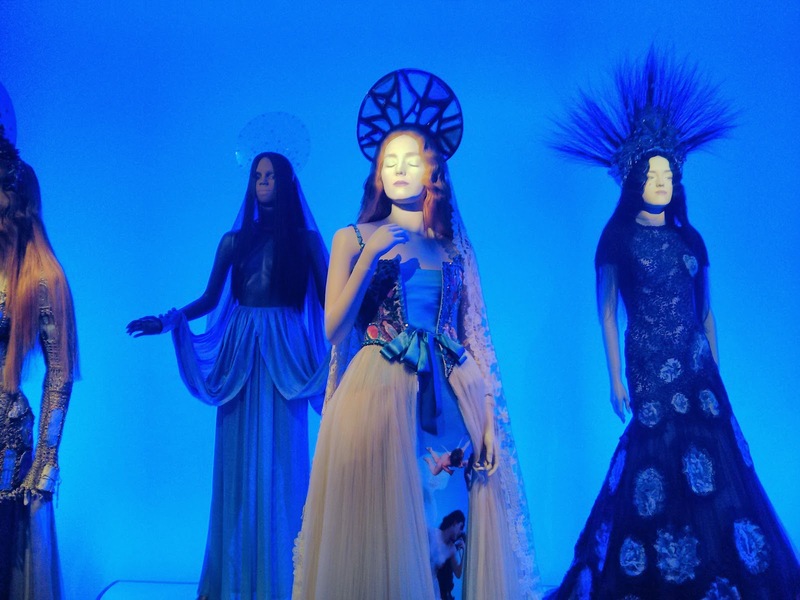 The Barbican’s Gaultier exhibition was a triumph in showing the multi-faceted world of Jean Paul Gaultier who proves that when it comes to style you can combine elevated glamour and elegance with fun loving rebellion. Creatively, Gaultier gives you the thrilling sensation that anything is possible.